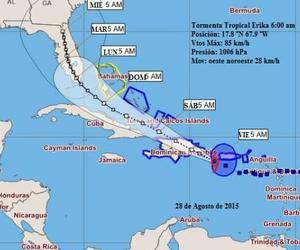 Tropical storm Erika is expected to hit the Dominican Republic Friday to later head for Turks and Caicos and the Bahamas, according to the latest advisories. Erika was located at 220 kilometers Southeast of Santo Domingo, the Dominican Republic on Friday at 6 am while moving west-northwest at 28 kilometers per hour. The storm has 85-kilometer-per hour sustained winds and higher gusts, so it has not changed much in intensity or organization, the advisory by the Cuban Weather Institute explains.